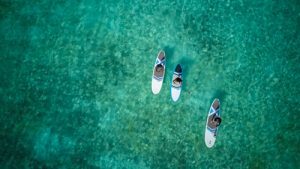 Creative Resort Agency, World Resorts of Distinction (WRD), is pleased to announce that one of its clients in the Maldives, Coco Collection, is sponsoring an unprecedented stand up paddle boarding campaign in the Maldives that aims to raise awareness about the environment, and in particular, ocean health. 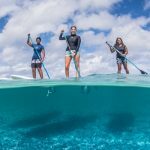 ‘Stand up For Our Seas’ will see four women paddle board 100 kilometres through the Baa Atoll between 21 – 28 February, with the intention of educating people about plastic pollution, climate change and marine wildlife in the region. Dr Cal Major, Dr Claire Petros, Dhafeena “Dhafy” Hassan Ibrahim, and Shaaziya “Saazu” Saeed will start their round-trip journey at Coco Palm Dhuni Kolhu and then travel through the islands in the Baa Atoll, stopping at resorts to talk to guests about environmental dangers and some of the initiatives already underway in the Maldives to tackle these issues. WRD Resort Marketing Manager, Narelle Christoffersen-Langton, said Coco Collection – which comprises three boutique properties in the Maldives – is committed to preserving its ocean home and this expedition is just one of the sustainability initiatives in play across the resorts. Coco Collection’s sustainability program, ‘Coco Dreams Green’ is dedicated to reducing the consumption of single-use plastic – with an end goal of zero – at all Coco Collection properties, including their corporate office. It also includes a monthly island clean-up program to clean the beaches, reefs, and lagoons of non-biodegradable debris; and marine conservation awareness and outreach programs for guests and staff. In 2015, Coco Collection announced an official partnership with the Olive Ridley Project, a UK charity whose mission is to remove discarded fishing nets (also known as ghost nets) from the ocean, and to rescue and rehabilitate sea turtles injured by these nets. As part of this partnership, they opened a Marine Turtle Rescue Centre at Coco Palm Dhuni Kolhu, the only one of its kind in the Maldives. The resort’s resident Marine Biologist also works closely with the Olive Ridley Project to remove ghost nets from surrounding seas, and to conduct an awareness and education program for guests, staff and local schoolchildren.